The new guidance recommends three drugs, treating two types of thyroid cancer to be made routinely available in the NHS. Cabozantib, also known as Cometriq, made by Ipsen and sorafenib, known as Nexavar made by Bayer have been recommended by NICE to come off the Cancer Drugs Fund and into routine use. Lenvatinib, or Lenvima made by Eisai has also been recommended for routine NHS use. It is estimated by the companies that approximately 1,300 people could benefit from these treatments over the next five years. These recommendations have been made in two appraisals. In one, cabozantinib is now recommended as an option for treating medullary thyroid cancer (MTC) that cannot be operated on or has spread around the body. MTC is a rare type of thyroid cancer with around 80 people diagnosed with it each year in England. Cabozantinib is a targeted therapy which works by blocking certain proteins on cancer cells, stopping them growing and dividing. It is estimated from the clinical trial data, that the drug gives patients an extra 5.5 months of life by slowing down the growth of the disease. Cabozantinib is currently one of the only 2 treatment options for patients with this type of thyroid cancer. In the other appraisal, lenvatinib and sorafenib are now recommended as options for differentiated thyroid cancers that have continued to grow or spread around the body after surgery and radioactive iodine therapy. Differentiated thyroid cancers are the most common type of thyroid cancer and affect around 1,800 to 2,790 people each year in England. Approximately 200 of those people have tumours that continue to grow after radioactive iodine therapy. Both drugs work by blocking certain proteins in cancer cells to shrink the tumours, extending the length of time people live with this type of thyroid cancer. 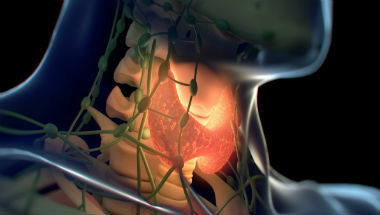 There are around 3,400 cases of newly diagnosed thyroid cancer in the UK each year1. Over the last decade, thyroid cancer rates have more than doubled in the UK2.